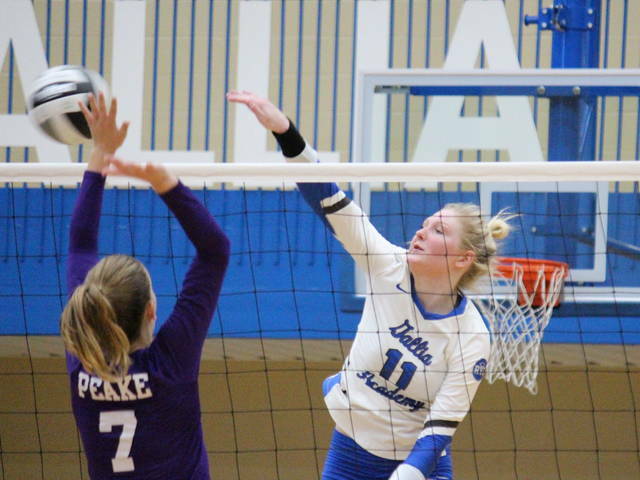 Gallia Academy sophomore Maddy Petro (20) gets a block alongside teammate Peri Martin (7), during the Blue Angels’ 3-0 sweep of Chesapeake on Tuesday in Centenary, Ohio. CENTENARY, Ohio — Just another dominant evening. 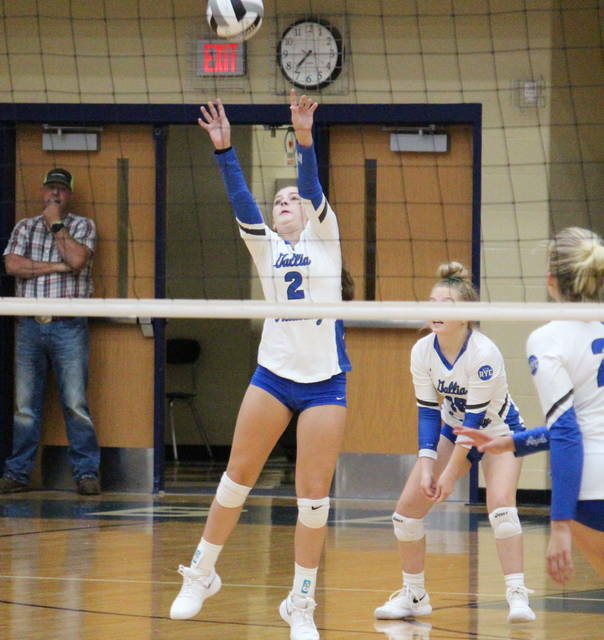 The Gallia Academy volleyball team earned its 35th straight Ohio Valley Conference victory on Tuesday in Gallia County, as the Blue Angels swept guest Chesapeake with double-digit margins in each game. 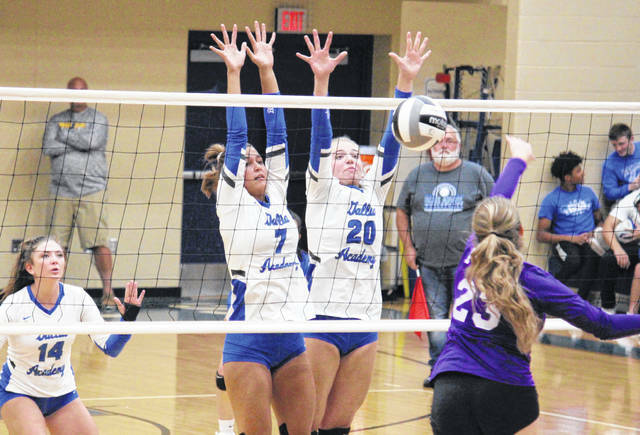 Gallia Academy (7-0, 6-0 OVC) — winner of 24 straight league matches at home — fought through ties at 2-2 and 9-9, but never trailed in the opening game, winning by a 25-15 count. Chesapeake gained its first lead of the evening at 4-3 in the second game, but GAHS was back in front at 6-5 and led the rest of the way to the 25-10 win. The Blue Angels never trailed in the final game, sealing the sweep with a 25-14 victory. Following the victory, GAHS head coach Janice Rosier noted her team’s positive attitude led to another excellent performance. The victory is Gallia Academy’s 13th in a row in the regular season overall. The Blue Angels have also won 28 consecutive single games in the regular season, with a string of nine straight sweeps. Rosier also acknowledged that, while the Blue Angel record may be perfect, there are still areas the team needs to work on. In the triumph, GAHS had 18 aces and a serve percentage of 87.7. The Blue Angels also collected 36 digs, while posting a 18.9 hitting percentage and a side-out percentage of 61. Chesapeake had a serve percentage of 92.7, a trio of aces, 30 digs, and a 31.1 side-out percentage. Gallia Academy’s service attack was led by Ashton Webb, who posted 11 points, including four aces. Alex Barnes was next with nine points and six aces, while Hunter Copley and Taylor Burnette had eight points apiece, with four and two aces respectively. Maddie Wright earned seven service points and two aces in the win, Peri Martin chipped in with six points, while Bailey Barnette earned one point. Webb and Barnes also led the Blue and White at the net with 13 and 12 kills respectively. Maddy Petro had eight kills and the team’s only block, while Wright, Martin and Burnette each had one kill. 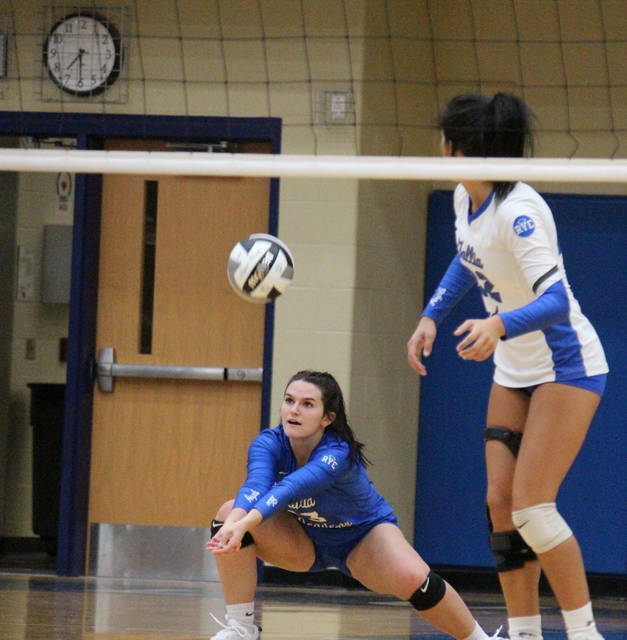 Martin finished with a match-best 28 assists, while Barnes led the Blue Angel defense with 10 digs. Shia Ervin led Chesapeake with four service points, followed by Faith Fletcher and Corinne Ferguson with three each, including an ace by Ferguson. Karli Davis and Mollie Watts both marked two points, with an ace by Davis, while Chloe Handley and Katy Spears both had one point, with an ace by Handley. Davis marked a kill and a block for the guests, Ferguson had a one kill and a pair of assists, while Fletcher came up with a kill as well. Ervin and Watts both earned a block, while Davis and Handley led the CHS defense with eight digs apiece. GAHS will look for a season sweep of the Lady Panthers on Oct. 9 in Chesapeake. Gallia Academy will be back on its home court on Thursday against Fairland.